I bought this starter kit as a treat for myself before Christmas because I saw one of the stamping plates that is in it, fell in love with it, found out you can only get it in this box, and consequently bought it. So I thought I might as well show you the whole box in one post and I have done a few mani's using the items in here, some are sort of bad and some are sort of awesome, or at least I think so. These are the contents of the starter kit and looking at the other starter kits on the website, you get the same amount of items in each one. So there are 2 plates, MO16 and MO17. Then 2 stamping polishes, Yummy Gummy and Mirror Mirror. And you get a stamper and scraper in all of the kits too, and I love this stamper so much! And finally, you get a little stamping and stamper care guide in each one too, very handy for those starting out. So lets start out with MO16. This is the plate that I fell in love with and that lead me to buy the kit. 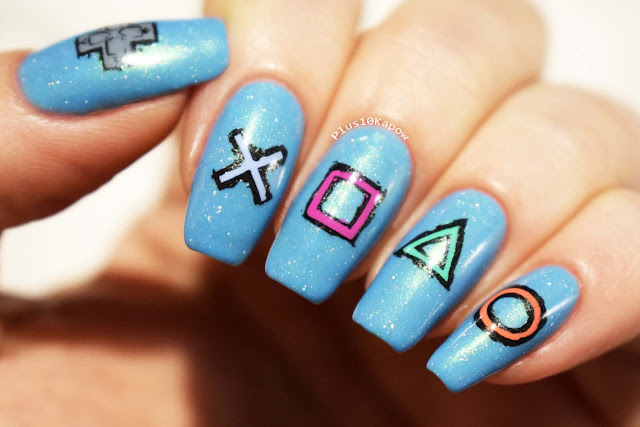 I am a sucker for nerdy plates, this we know and the first things that caught my eye were the Playstation button symbols and d-pad, so cute. But then I noticed that it had dice, comic callouts (bubbles and words), 8-bit gaming items (mushroom, heart, potion bottle and star) and those are just the smaller images. 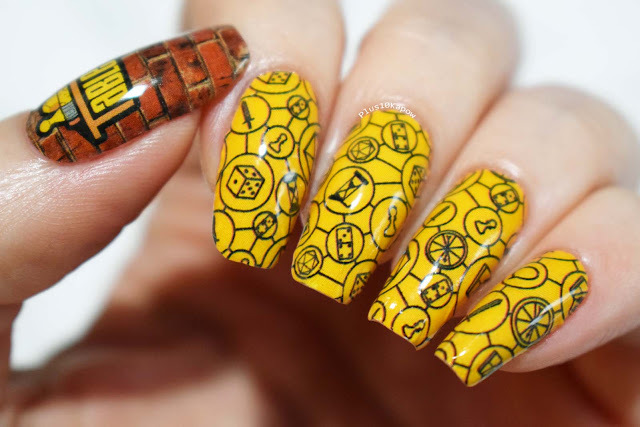 In the full nail images there is a Tetris image perfect for reverse stamping, 8-bit hearts, circuitry, binary and an awesome nerd filled, chalkboard inspired image. It is so bloody awesome. While I was busy fawning over MO16, I hardly noticed the cool images on MO17, namely my favourite one from the plate, the dinosaur skull cameo, can you find it? This plate has more of a wider range of stuff on it, including textured full nail images and sound waves (pretty cool) I feel like this is the plate you would go looking for if you were for a cool image to either layer on top of or finish/tie it all together. The stamper included is what they call their Ice Cube stamper. 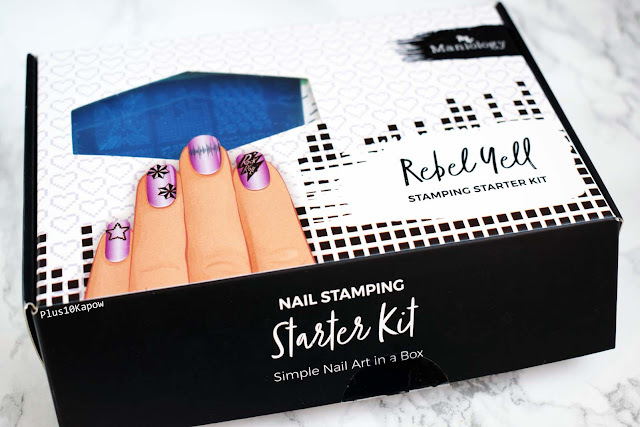 It is a clear stamper that is open at the bottom, has a pretty durable stamper head based on my testing and is the perfect size to pick up full nail images. It picked up first time, no problem and the image was full, no bits missing at all. Nothing bad to say about this stamper. The scraper that comes with it is proper dinky, making it difficult for me to hold but I did give it as good a test as I could. 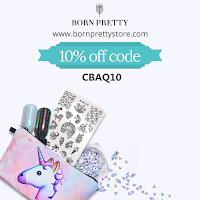 It has the right flexibility to get a good, smooth scrape and for those that can hold it, it will be great.These would be perfect for someone travelling but needs some nail art stuff with them. The first of the 2 polishes is Yummy Gummy. 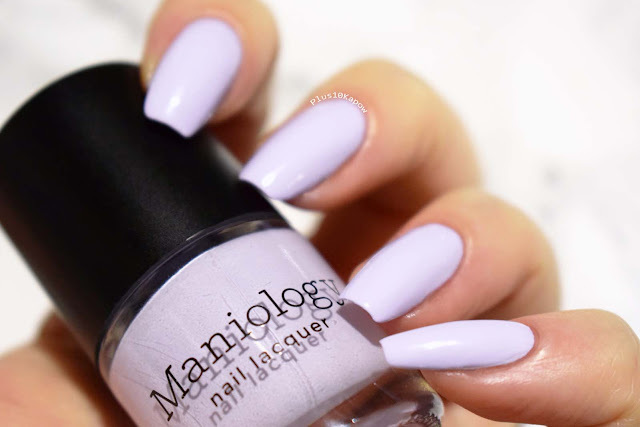 It's a pale purple that is great for wearing as a regular polish and for stamping. I did find that this needed 2 thin coats to even itself out but it has a great formula, dries quickly and to a shiny finish and it is easy to clean up and remove. 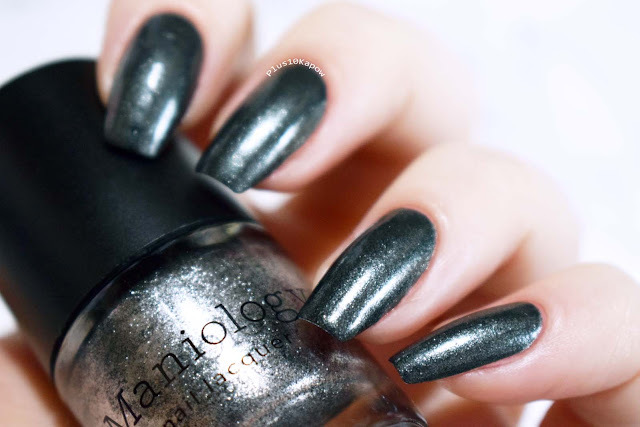 The second polish is Mirror, Mirror, a smoky black duochrome. 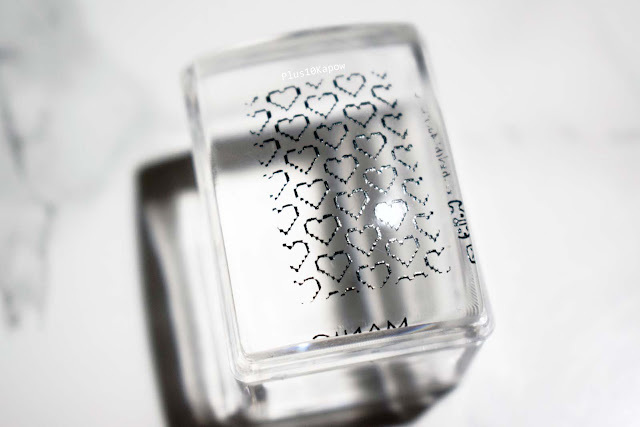 This is a one coater when worn as a regular polish and stamps really nicely too. It dries semi-matte, is slightly more difficult to clean up and remove because of the shimmer glitter but still not too much of a hardship. I love this polish. Both bottles are 7ml, which should last you a fair amount of time if you are just stamping with them but considerably less if wearing them as a regular polish. 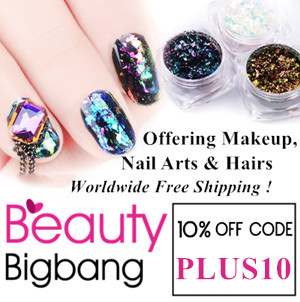 So lets jump in to my nail art using these products now. So the test nail art went well. On to the next. I saw the plaid and the snake and instantly thought Slytherin! What Slytherin wouldn't? 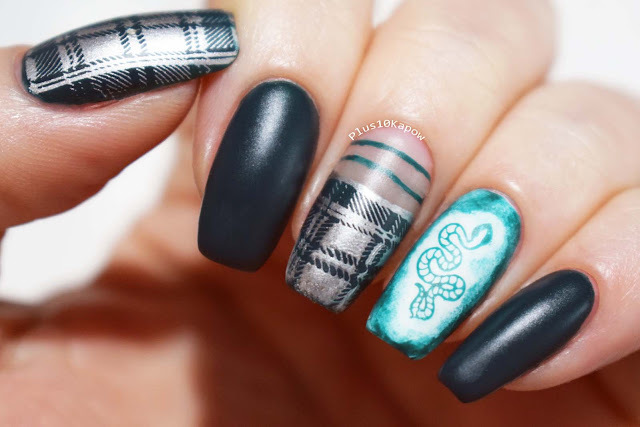 Admittedly, I used the wrong green for this (Barry M Watermelon) because although it stamped the snake nicely and sponged on a nice shade, under the plaid and on it's own, it was just too dark. Those lines on my middle nail were straight btw, until I put the topcoat on, and then I must have pressed too hard and smooshed them. So not the best of Slytherin nail art but there you go. At least I know the tiny details of the plate pick up and also that I need to work on keeping lines straight both in stamping and freehand. This was topped off with Barry M Matte topcoat. So now we move on to the nail art I actually do like! Now, I have no idea if dinosaurs had red skin, they possibly did, maybe they did not. 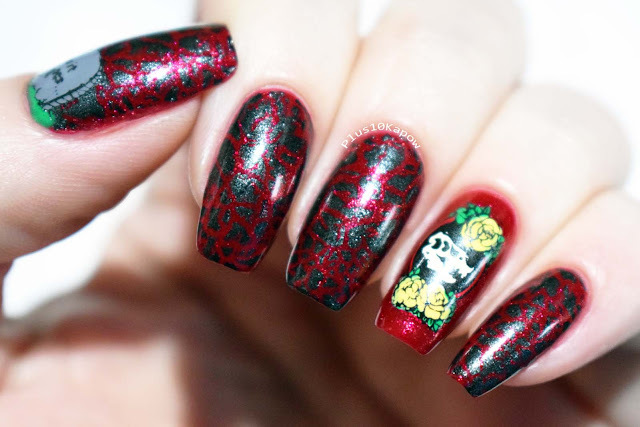 But I wanted to use Mirror, Mirror to stamp here and I thought that a sparkly red would be the perfect to go with it. I used Barry M Glitter Gelly Ruby over Barry M Blood Orange for this base and I love how it shows under the scales stamp. I also HAD to use that dinosaur cameo. I tried to use some Jurassic Park colours here which kind of got lost in translation but I still really love it. It's definitely my favourite image off this plate. I used NYC Lexington Yellow for the roses, Barry M Spring Green for the leaves and I mixed a smidge of Lexington Yellow in with Barry M cotton for the dinosaur skull. These images were all from MO17. Finished off with Seche Vite. I also had to use that teeny gravestone, so I added that to my thumb but again, I was too heavy handed and impatient so I smudged the 'g', but it still looks cute and I really love this mani irl. I love this nail art, a lot! 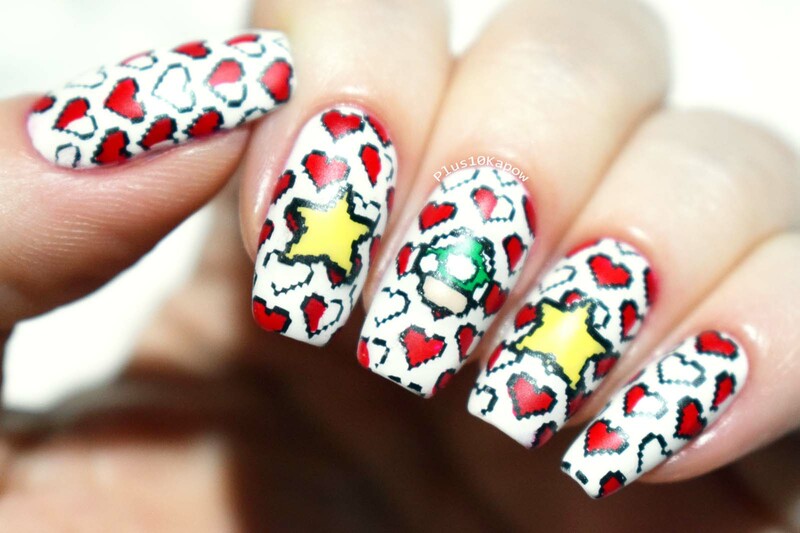 I think that 8-bit hearts on a white background look fab but I kind of wanted that to be the background for this nail art. So I reverse stamped five of this image and just randomly filled in half hearts and full hearts and left some blank. Of course, the transfer of the blank images didn't go well, so there are some empty spaces but you can barely notice that. I stamped using Mirror, Mirror and filled in with Barry M Siren. Then I reverse stamped the mushroom and two stars, using Mirror, Mirror, then NYC Lexington Yellow for the stars and Barry M Spring Green, Barry M Cotton and Barry M Lychee for the mushroom. I topped them off with Barry M Matte topcoat. 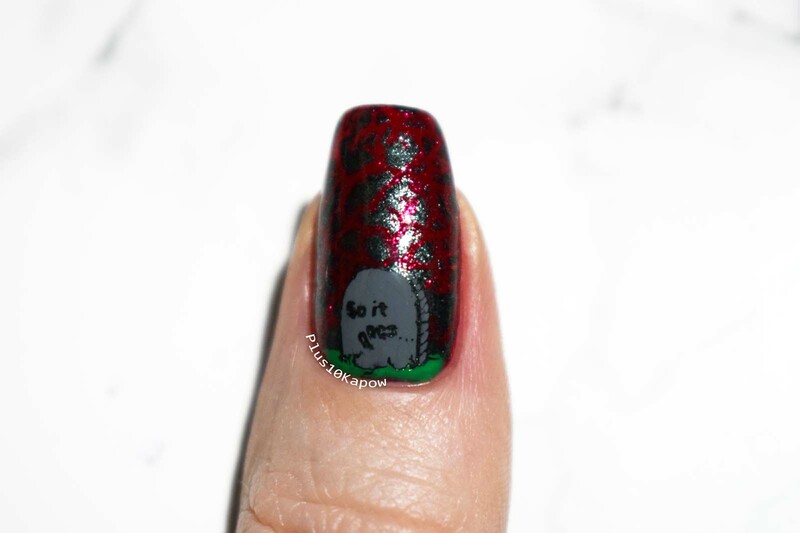 And this nail art was my favourite of them all and just so simple to do, plus I had to do it as it was what drew me to the plate in the first place. My base is the beautiful June 18 from the Nail Lacquer UK challenge. I stamped the Playstation symbols and d-pad with Mirror, Mirror and then filled them in with their respective colours. Barry M Grey Matter for the d-pad, Barry M Laguna for the , Barry M Sugar Plum for the , Barry M Greenberry for the and Barry M Papaya for the . Then I sealed it all with a coat of Seche Vite. 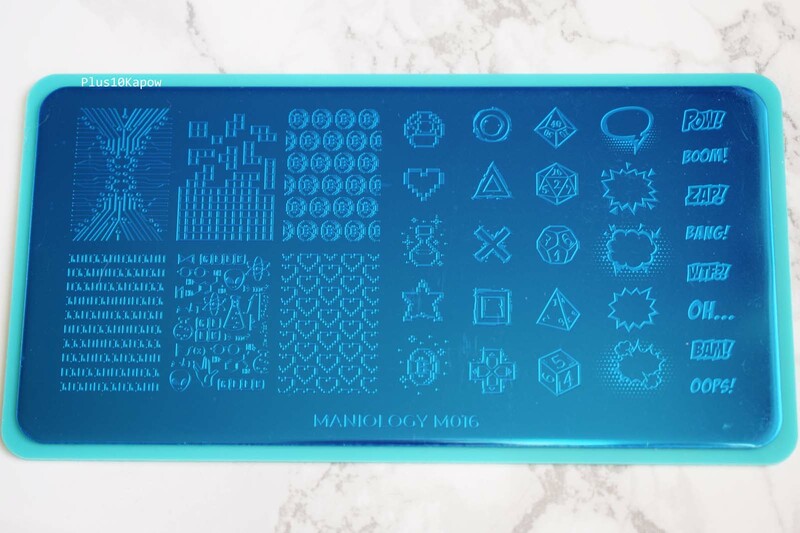 I did find that Mirror, Mirror has a slight tendency to smudge if you aren't careful but I am beyond happy with this kit, especially since I technically just bought it for the one stamping plate, which is a definite must have for gamers and nerds alike. 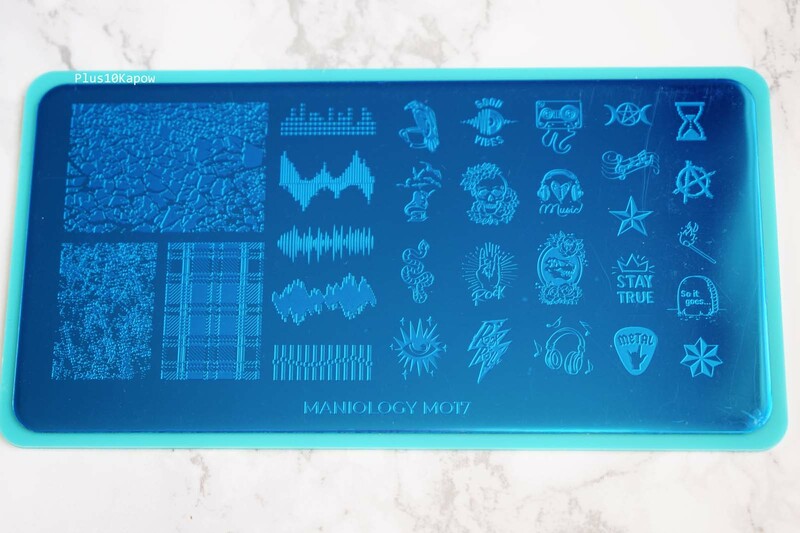 If you fancy grabbing it you can find it here and if you use code PLUS10KAPOW you can get 10% off your Maniology order or the code can give you $5 off any Mani x Me monthly products!